Make those special moments last forever with our gorgeous baby monthly milestone blanket. This is a great photography prop to record your babies special milestones. Your baby will love laying on this mat to record their special milestones as the wooden circle and arrow highlight and point to milestone ages and dates. Your family and friends will love seeing your little ones achievements - time is precious so take lots of lovely photos! 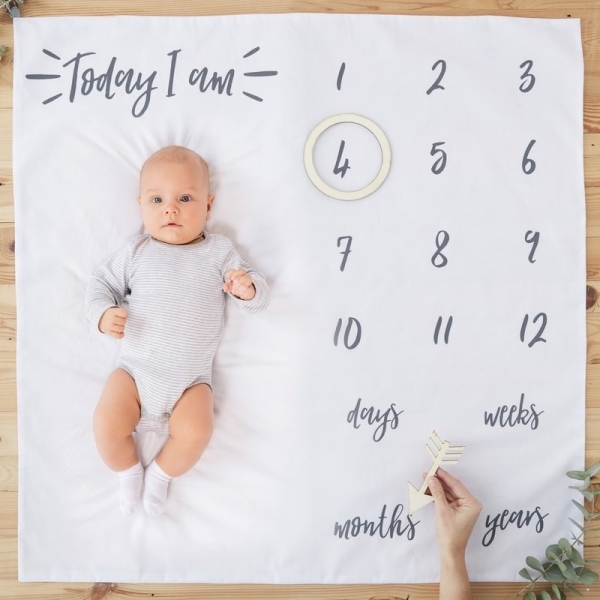 Lay the stylish white mat on the floor and use the wooden circle and arrow to point to the scripted numbers and day, week, month or year to forever remember important dates of your baby. Each pack contains 1 white blanket measuring 1 m x 1 m. 1 Arrow measuring 6 cm (H), 15 cm (W) and 0.5 cm (D). 1 circle measuring 15 cm (Diameter and 0.5cm (D). Be sure to share your photos with us, we would love to see your little baby grow.